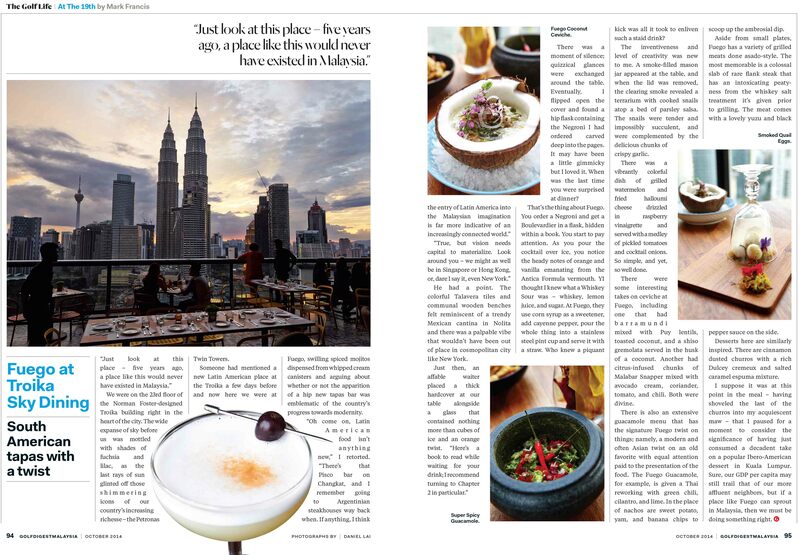 Fuego at Troika Sky Dining is fast becoming the dining destination of choice thanks to the sensational view it boasts of the iconic KL Twin Towers and city skyline. Iconic sportsman David Beckham was in town recently to launch the Haig Club single grain whisky in Malaysia. World famous Malaysian designer, Datuk Jimmy Choo, was on hand to greet Beckham at Troika Sky Dining. 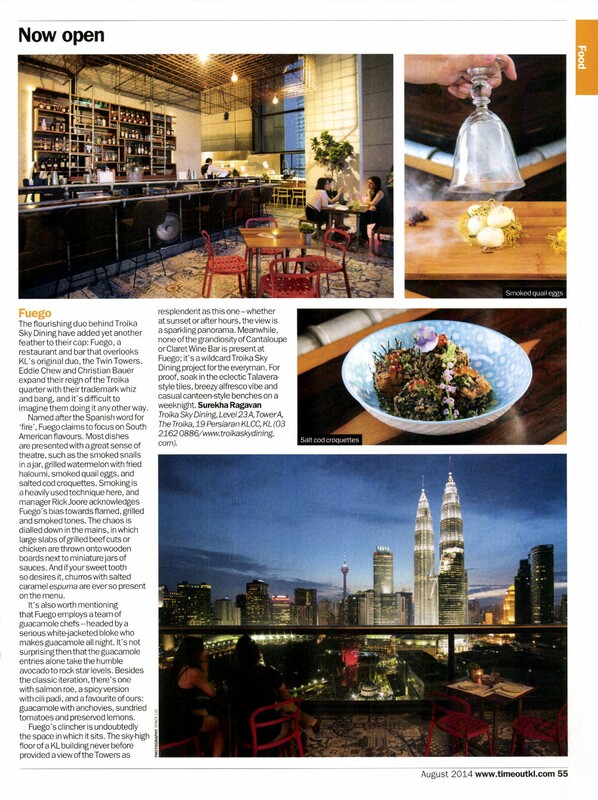 It is one of 2014's best new eateries, certain to capture extensive notice in the weeks to come. There's a sense of freedom up here. It's easy to imagine that the boisterous Latin music weaving a soundtrack for your sky-domed evening is borne on the same breezes that chase away your worries... instead of piped in by speakers flanking the artfully-lit, wood-and-steel bar backing the large open balcony that is Fuego. 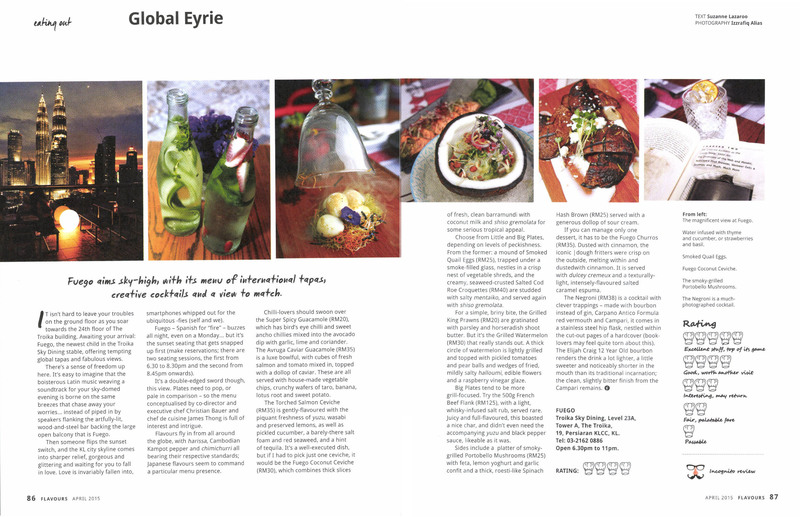 The colorful Talavera tiles and communal wooden benches felt reminiscent of a trendy Mexican cantina in Nolita and there was a palpable vibe that wouldn't have been out of place in cosmopolitan city like New York. Not only do you need to go to Fuego for the delicious tapas menu, but you also need to go for the cocktails. If you are looking for fantastic food, cool party vibes, and some of the best views of the fireworks in town, then you need to book your spot at Fuego for the New Years Eve Supper Buffet. Fuego's guacamole takes the humble avocado to rock star levels. The perfect place to unwind after work, celebrate on weekends and definitely take in the fireworks during special occasions. Between habanero, jalapeno or shishito chillies, choose one or all 3 of the chilli dishes that will leave you tingling in fiery spice in all the right places.